Matthew McConaughey is no stranger to the steesh, as we’ve seen in the past here and here. 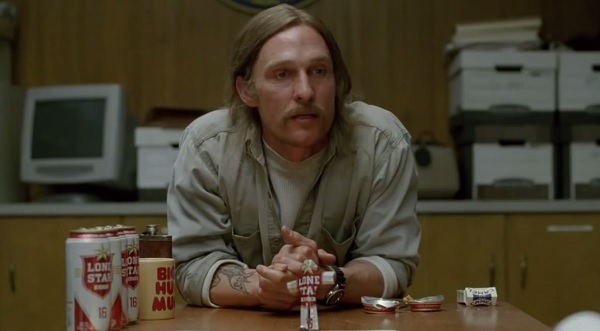 And now, he’s back with another dandy as the 2012 version of Rust Cohle in HBO’s wonderfully-creepy new show True Detective. If you haven’t watched this show yet, it’s worth it just to see him make those little men out of his beer cans. This entry was posted in Actor Mustache, TV Steesh and tagged hbo, matthew mcconaughey, Moustache, moustaches, mustache, mustaches, Rust Cohle, True Detective on February 18, 2014 by Los Bulls.